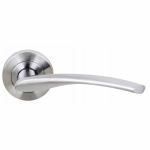 The Atlantic S22R/SC is part of the high quality Arizona range of lever door handles on rose, these door handles are supplied in a satin chrome finish that will suit a range of door styles. This handle is sold in a pair and is ideal for use in domestic and commercial environments. This quality door handle comes supplied complete with an 8mm spindle and a fixing kit. Also available to order are escutcheons and WC turns that will match these quality door handles.